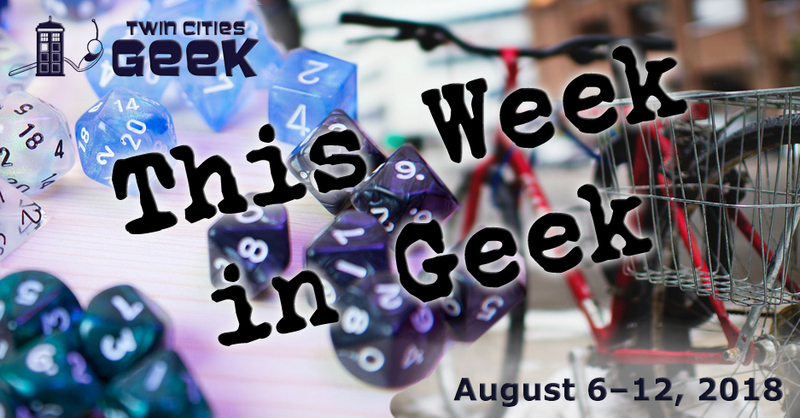 Welcome to This Week in Geek, your guide to events of interest to the Minnesota geek community for the week of Monday, August 6th to Sunday, August 12th. The Minnesota Fringe Festival is 11 days packed with plays, all 60 minutes or less, held at a variety of spaces throughout the Twin Cities. The variety of great shows from local performers and writers means you should be able to find something to scratch your geeky itch. This year’s inventive offerings include The Flashlight Zone: 20 Science Fiction Plays in One Hour, Medusa, A Justice League of Their Own, Geminae, What To Do In Case Of Dinosaur Attack, and many, many more. See the full listing of shows and the event schedule, and check out our recent review of Remy Raygun of the Space Brigade: A Build-Your-Own Space Opera, a play that’ll be a hit with geeks of all ages! When: Monday, August 6th at 6:30 p.m. When: Tuesday, August 7th at 6:15 p.m.
Books & Bars is an “open public book club show” hosted and moderated by Minnesota Public Radio senior producer Jeff Kamin that provides attendees with “a unique atmosphere for a lively discussion of interesting authors, fun people, good food, and social lubrication.” The book being read and discussed this month is The Vision by Tom King, an Eisner Award-winning limited series run from Marvel Comics focused on what it means to become human. When: Tuesday, August 7th at 7:00 p.m. Enjoy a night of community and tea with Tea and Meeples, a weekly gathering of friendly geeks at Panda Castle in Richfield. This week, the group will get together for a night of glow-in-the-dark bowling and enjoy a dinner of grilled peppers. When: Tuesday, August 7th at 7:30 p.m.
Come and experience YogaQuest, a blend of yoga and fanfiction storytelling led by certified yoga instructors. Experience a yoga workout experience and a story at the same time. August is Monster Month, and the theme for this week is the monster movie Reptilicus (which you might recognize from the latest season of MST3K) so get ready to slither to some classic cheesy monster action! This event costs $15. When: Tuesday, August 7th at 9:00 p.m. Enjoy an evening of community and movie magic under the stars! Movies start at dusk and are free and open to the public. Screening this week is Kubo and the Two Strings, an award-winning work of stop-motion animation telling the tale of a 12-year-old boy, his magical shamisen, and his travels with an anthropomorphic beetle and snow monkey. Also be sure to check the complete schedule of screenings this week on the site. When: Wednesday, August 8th at 6:00 p.m. Celebrate the funny little weirdos who act as the main reason for the internet to exist at this video festival! See the best videos, listen to music, watch fireworks, and celebrate felines with other cat and cat-video lovers. Doors open at 6:00 p.m., but the film reel will start around 8:00. This is an all-ages event; kids get in free and general admission is $10 until August 1st, and then goes up to $15, so the early cat catches the yarn. There are also VIP tickets available for $75, providing access to the air-conditioned Securian Financial club, and a variety of food. When: Wednesday, August 8th at 7:00 p.m. When: Thursday, August 9th at 7:00 p.m. When: Thursday, August 9th at 7:45 p.m.
Raise a glass to local history at Waldmann Brewery and Wurstery, a local purveyor of beer and wurst with a historic flair. This monthly series focuses on specific areas of local history, allowing participants to learn while savoring a pint of beer made in a 19th-century style. This month’s program will focus on all the small stories of daily life at Fort Snelling. Letters and other primary sources will shed light on the regular people who lived here 150 years ago. This is a free event, and registration is handled on a first come, first served basis on their website. When: Thursday, August 9th at 8:30 p.m. Enjoy an evening of community and movie magic under the stars! Movies start at dusk and are free and open to the public. Screening this week is A Wrinkle in Time, the visually stunning adaptation of the beloved young-adult novel. Check out the complete schedule of screenings this week. When: Friday, August 10th at 5:00 p.m.
Get schwifty in Minneapolis and come on down to—buuurp—check out a large Rick-shaped truck full of exclusive Rick and Morty merchandise and collectibles in the company of other fans. The #Rickmobile is a unique pop-up shop with exclusive custom-designed Rick and Morty collectibles. Parking is limited, and the queue line may be capped, so don’t wait around on this one. For more information, check out the Rickmobile website. When: Friday, August 10th at 6:00 p.m.
Community Grounds in Columbia Heights will be hosting an evening of Game of Thrones trivia. This free night of grim low-fantasy trivia is open to teams or foolhardy solo players. Can you and your house tell the difference between a Tully and a Stark, recall the names of all those dragons and Valyrian-steel swords, and win the Iron Throne…of trivia? When: Friday, August 10th at 6:30 p.m. When: Friday, August 10th at 7:00 p.m. Circus Juventas returns for a summer show with Steam, a show in which the contemporary circus arts tell a steampunk tale! In this story, H.G. Wells and Jules Verne embark on a time-traveling adventure told through the spectacle of the circus, full of sky pirates, morlocks, Captain Nemo, and other wonders. Tickets range from $18.50 for children and seniors to $45 dollars for a VIP box, with a variety of packages available. This show will go on through August 12th. When: Friday, August 10th at 8:30 p.m. When: Friday, August 10th and Saturday, August 11th at 11:30 p.m. The Riverview Theater, a neighborhood theater known for affordable second-run cinema, will be continuing its summer late-night programming series with the shiniest flick in the whole Verse, Serenity. This film-followup to the cult series Firefly continues the adventures of a crew of cunning space outlaws who sometimes end up as big damn heroes. All tickets are $3, and the theater only takes cash. When: Saturday, August 11th at 5:00 p.m.
Dance, drink, and be merry to celebrate the birthday of Harry Potter and Harry Potter fandom in general! Enjoy a variety of taverns, bars, clubs, and the like with exciting magical cocktails, Harry Potter cosplay (including a limited number of knit scarves that come with tickets), and more. Tickets run $16–$25, and are for witches, wizards, and muggles of 21 years or older. Participating bars include the 508, the Exchange, Kieran’s Irish Pub, Last Call, the Pourhouse, Rouge at the Lounge, and Brother’s Bar & Grill. When: Sunday, August 12th at 10:00 a.m. When: Sunday, August 12th at 12:00 p.m. When: Sunday, August 12th at 12:30 p.m. Gender Jam—a meetup group for trans, gender-nonconforming, questioning, and intersex youth—will be meeting up for an afternoon of community and fun. This week, Gender Jam will be making a field trip to Webber Natural Swimming Pool. Meet there at 1:00 p.m., or meet early at the Exchange in Minneapolis for a ride over together. As always, bring your permission slip if you are under 18.